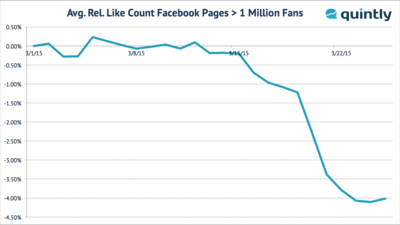 The social media analytics provider quintly analyzes the Facebook metric change for the "Total Fan Count". With this metric change Facebook does not count deactivated and inactive accounts anymore. Through this change pages lost up to 4% of their fans in the last 14 days. Cologne, Germany 25th March 2015. Beginning from the 13th March Facebook changed its “Total Fan Count Metric”, with the effect that almost every Facebook Fan page claimed a loss of their amount of likes. With this metric change Facebook does not count deactivated and inactive accounts anymore. Accounts are considered to be inactive when they did not log in the social network for more than six months. 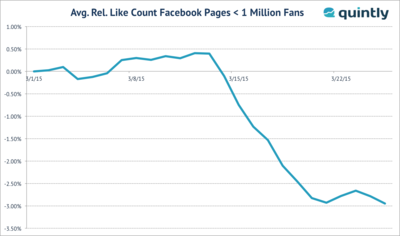 Pages with less than 1 Million likes lost 3% and Bigger Pages on average 4%. Sources, such as Techcrunch, informed their readership of an upcoming loss two weeks ago. The social media analytics provider quintly published several updates on their Twitter and Facebook-Pages showing the “current status” of the metric change. Now, as the metric change seems to be completed, quintly published a study on their blog showing the effects. The study may interest digital marketers as they want to understand the numbers and its effects on upcoming decision-making. As the total fan count affects the interaction rate of facebook pages, numbers will change in the next weeks, without changes made from the fan page admin. The maybe predicted effect in one or two weeks time be that the interaction rate increase. quintly announced that they will publish a follow up study regarding this phenomenon when the effects are tangible.